Activities for Middle-school teens (Junior Young Friends) and High-school-aged teens (Senior Young Friends) vary greatly by year depending on the students involved. Some Sundays may be skipped and some may involve neighborhood walks, coffee shop walks, or playing board games. Group leaders or students bring topics of interest for informal dialogue. Usually the JYF’s meet separately with hands-on activities while the SYF’s focus on fellowship and conversation with other senior high students. To join our email list for updates on current activities, please contact Sonja Toutenhoofd at sonjat3141@gmail.com. Colorado Regional Meeting: JYF’s and SYF’s enjoy gathering for several days in the fall in Estes Park YMCA of the Rockies and for an afternoon each spring at one of the Colorado Meetings. These are welcome opportunities for youth fellowship. Mountain Friends Camp: Camp presents another opportunity for JYF’s and SYF’s from a wide range of meetings to get together. Our students have a great time with old and new friends: http://mountainfriendscamp.org. 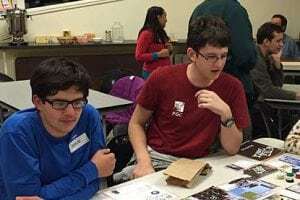 Intermountain Yearly Meeting (IMYM): Teens enjoy time each June with Friends from other mountain states (Colorado, New Mexico, Arizona, Utah and Wyoming). As one would expect with Quakers, each class reflects the uniqueness of both the adults and the students who participate. Sonja Toutenhoofd and Marc Gacy almost single-handedly run the Junior Young Friends (JYF) and Senior Young Friends (SYF) groups. They have been involved with 1st Day School for many years as their three youngsters have grown. Today I’m sharing a lesson from Sonja as an example of their masterful Quaker teaching. One sign of an adept teacher is the flexibility and apparent effortlessness of their lessons as well as an ability to tailor the content to the particular students involved. Sonja and Marc do this so naturally and humbly that we in the Meeting remain mostly unaware of the wonderful content of their classes. For example, a small group of Junior and Senior Young Friends recently enjoyed a cool hands-on calligraphy lesson from Sonja. It would be all too easy to think that the kids were simply experimenting with calligraphy pens (a valid activity in itself) without realizing the history and traditions that Sonja conveyed during that lesson. As they tried out calligraphy pens and ink, Sonja shared the Quaker tradition of calligraphy, starting with the hand-penned greeting in our entry hall. Have you checked it out carefully? I know I hadn’t, and I was thrilled to see the detail in the writing and to learn that most meetinghouses have a similar calligraphy welcome sign. Did you know that most issues of Friends Journal include advertisements for calligraphers, who hand pen wedding vows? Even young children sign their names on poster-sized wedding certificates as witnesses to a marriage. As a fairly new Friend myself, I hadn’t known this, but the students in Sonja’s class that day know all about it. When they participate in a Quaker wedding, they will understand the process and its underlying history, which she described as they were experimenting with their own personal calligraphy. During the lesson, one student chose to write out some of the testimonies in big beautiful writing: PEACE…. This lesson combines the history we see right on our meetinghouse walls and in the journal on our display table with self-directed student art and writing. It’s a lesson that the kids will remember for the fun of discovering a new art form as they reinforce their identities as Quaker youth.